The Index opened flat to negative and stayed weak for major part of the day, with each up-move being sold with ease, and closed at 8022.40, loss of 21.75 points. The broader market was also negative, with 554 advances to 925 declines. 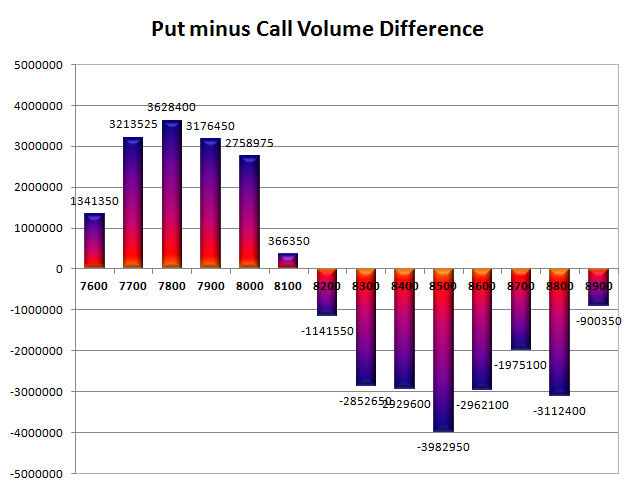 The broader range as per Option Table comes to 7800-8500. Call option 8000-8500 added huge 28.86 lacs OI with profit booking seen at 8800 and above strike prices. 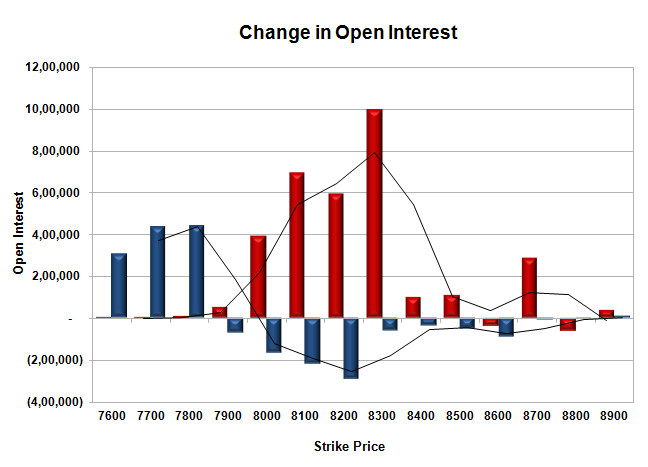 Put option 7800-7600 added huge 11.85 lacs OI with short covering seen at 8000 and above strike prices. 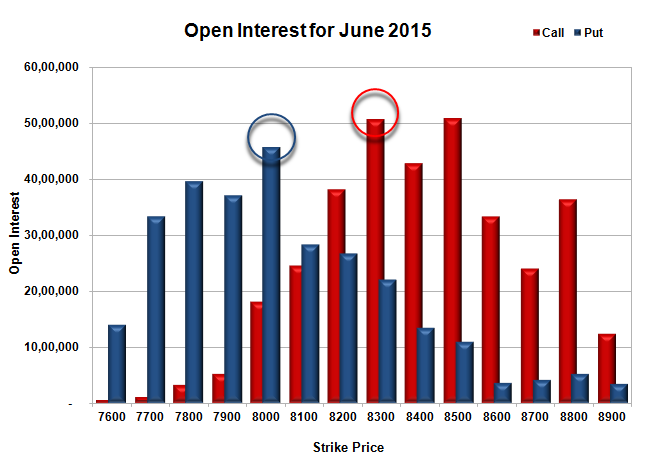 Nifty Open Interest is at 1,63,78,950 up by 1,32,400, with decrease in price, most probably short build-up. 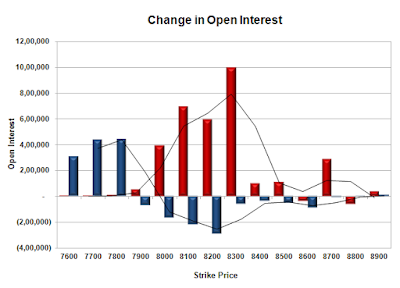 Bank Nifty Open Interest is at 23,38,425 down by 37,525, with increase in price, most probably short covering. FII’s bought 1.66 lacs Futures, which includes 3611 contracts long build-up and 3027 contracts short covering, with decrease in net OI by 584 contracts (includes 68923 longs to 62285 shorts for the day) and the Average Price comes to 8348.30. FII’s Index future open contract as on date is 337598 Longs to 325462 Shorts, Net Long 12136 contracts. Initial and best support still at 8000, with huge OI of 45.70 lacs and below that at 7900 with OI of 37.11 lacs. Initial resistance at 8100, with huge OI addition of 6.95 lacs and above that at 8200 with OI of 38.13 lacs. 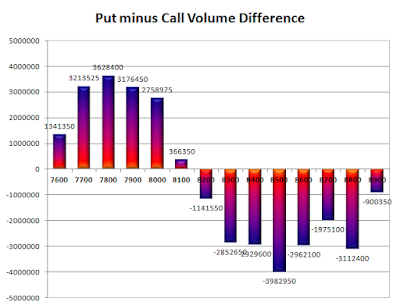 Day Range as per Option Table is 7954 - 8102 and as per VIX is 7947 - 8098 with 8028 as the Pivot.